Most people are aware of the harmful effects of smoking on our health, with lung cancer, throat cancer, and increased ageing all being possible results of long-term smoking. But many people do not realize the effects it has on our teeth, mouths, and oral hygiene. Here are just some of the negative effects smoking can have on our smile. Cigarette smoke contains nicotine, but it also has many other harmful components. Cigarettes are full of toxins and chemicals that can wreak havoc on our body. When you puff away on a cigarette, these toxins and chemicals first must pass through your mouth, where toxic cigarette smoke can cause a wide range of dental problems. Smokers are more likely to develop oral cancers, as cigarette smoke is carcinogenic. However, a lot of more ordinary dental problems, such as gum disease, are also caused by smoking. In fact, some estimates suggest that smoking can account for up to 75% of gum disease cases. This is because smoking can cause our gums to recede, as it reduces blood flow to our mouth and irritates our gums. Once gums have receded, the bottom or base of teeth are exposed and become more susceptible to disease and infection. Damaged gums result in little pockets where food can become trapped and bacteria can fester. The result? Bacterial infections, tooth decay, excessive growth of plaque, and sores. Often, one of the most noticeable symptoms will be bad breath. Smoker’s breath isn’t just due to the smell of cigarette smoke, but may also be partially due to tooth decay and bacteria. Another common dental problem caused by smoking is discoloured or yellow teeth. Nicotine is the major cause of stained, discolored teeth since nicotine turns yellow when it is exposed to oxygen. Both nicotine and tar can end up leeching into the enamel of our teeth, turning them a yellow—or even brown—colour. 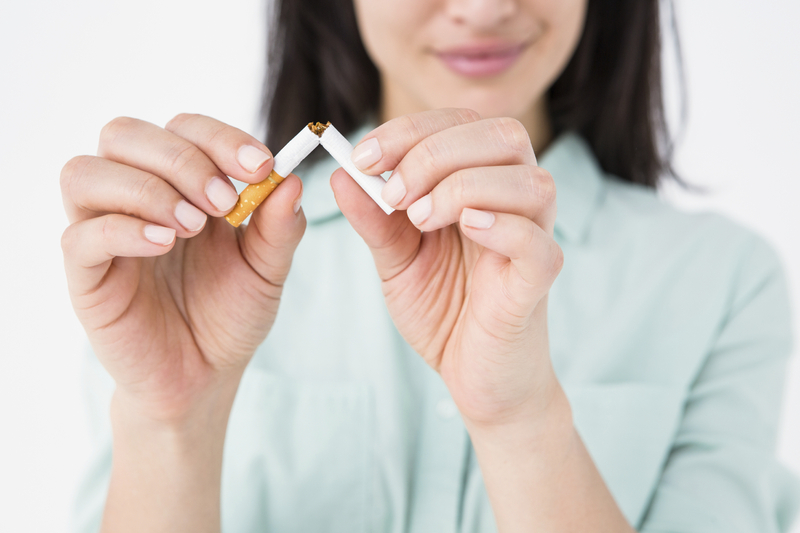 Heavy smokers will often have a noticeably discoloured smile. The good news is that this staining is only superficial and present on the surface of the teeth, but the bad news is that it looks just as off-putting as rotted teeth. The most obvious way to stop damage to your teeth from smoking is by putting down the cigarettes. While this is easier said than done, it can have a big effect on the health of your teeth. Unfortunately, stains will not go away simply from quitting smoking. Luckily, teeth whitening in Toronto is a common procedure offered by many dental clinics. Dentists can perform effective teeth whitening services that cannot be matched by OTC products. Dentists are allowed to use more powerful bleaching solutions to get the whitest smile possible, and they can also customize their treatment specifically for your mouth and teeth. By using professional teeth whitening services, you can do away with the staining and discolouration caused by smoking. There’s no reason to suffer with an off-colour smile. Princeview Dental has been a fixture of the Kingsway area in Etobicoke for over 20 years, where we’ve provided dedicated family care in a professional, welcoming, and modern environment. Please call us today at (416) 231-4562.